This article originally appeared in the December 17, 1990 edition of The Nation. "I make up my mind about people in the first 10 seconds, and I very rarely change it." So The New York Times quoted Margaret Thatcher as saying on the day of her resignation. I would be happy to think that the statement was truthful, since within minutes of first being introduced to me, Thatcher lashed me across the buttocks with a rolled-up parliamentary order paper. It happened in the course of an exchange of views about Rhodesia in the late fall of 1977, when she was still leader of the opposition and was pandering to the racists in her party and the electorate. Influenced perhaps by the fact that we were meeting in the Rosebery Room of the House of Lords, I made the mistake of bowing as if to acknowledge some point of hers, and she took swift advantage of my posture by shrieking, "Bow lower!" and plying the document above mentioned. Like the British electorate, now shaking itself after more than a decade of Thatcherite pouvoir, I often look back wistfully upon that spanking in the hope of decoding its significance. Within one year of being elected Prime Minister, in 1979, Thatcher had reversed herself and overseen the transition of Rhodesia into Zimbabwe. This achievement of hers, often overlooked, came after half a dozen Labor Foreign Secretaries had simply abdicated in the face of the white settler revolt. Nor was that the only instance of her breaking the rules of the stale, centrist, stagnant British consensus. By the Anglo-Irish agreement at Hillsborough she gave up Britain's absurd claim to exclusive sovereignty over Northern Ireland. And after her first meeting with Mikhail Gorbachev she became the first capitalist politician to declare that he was for real and meant business. It is absolutely safe to say that no Labor Prime Minister would have had the nerve to do either of those two things. So as I stood in the courtyard of the Louis Quinze embassy on the Rue Faubourg St.-Honoré on November 20 and saw her absorb the news that she had failed with her own party, I felt an unbidden emotion of regret. There seemed no disgrace in rejection at the hands of the Tory parliamentary caucus—as ripe a collection of opportunists and bond salesmen as you could meet in a day's march. I found myself hoping that she would make a fight of it, if only to expose the real disgrace, which is that under British "rules" such a caucus can, on a secret ballot, change the government in an afternoon. It is easy to summarize the foulness of the Thatcher years: the combination of Malthus and Ayn Rand that went to make up her social philosophy; the police mentality that she evinced when faced with dissent; the awful toadying to Reagan and now Bush; the indulgence shown to apartheid; the coarse, racist betrayal of Hong Kong; the destruction of local democracy and autonomous popular institutions. Yet every Tory in the House had voted gleefully for all of those things, and one of them, her newly anointed clone, John Major, has disagreed with Thatcher only from the right. While on the ostensible issue of principle, a common European system, Labor's conversion has been too late and too shallow to be convincing. Christopher Hill, perhaps England's greatest living historian, pointed out to me in the summer of 1988 that Thatcher had quarreled with the monarchy, the House of Lords, the Church of England, the Inns of Court, the University of Oxford and the Chiefs of Staff—every ancestral prop of the British state. Detestable though she was, she was a radical and not a reactionary. She has not been removed for any of her offenses against democracy or decency. Rather, she has been deposed by those who worship only opinion polls and their own skins and who yearn for a quiet life and business as usual—living gallantly off the fat of the land. "An end to conviction politics," smugly wrote Peter Jenkins, Fleet Street's most devoted practitioner of consensus journalism. Let us hope not. 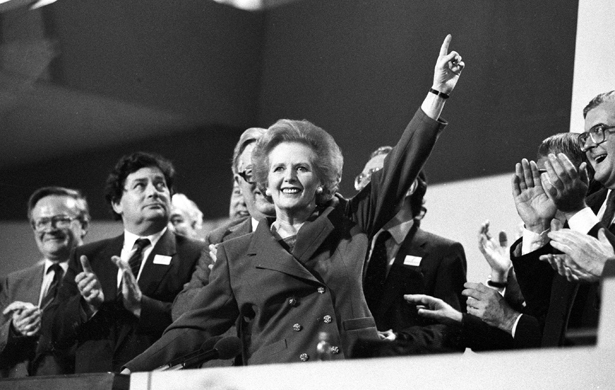 "Thatcherism" has made possible a movement for a serious, law-based constitutional republic in Britain and has hacked away at the encrusted institutions and attitudes that stood in its path. Thatcher has herself shown that there is power and dignity to be won by defying the status quo and the majority rather than by adapting to them. If the British left, which she froze into immobility like Medusa, could bring itself to learn from this, then we might not have to look upon her like again.